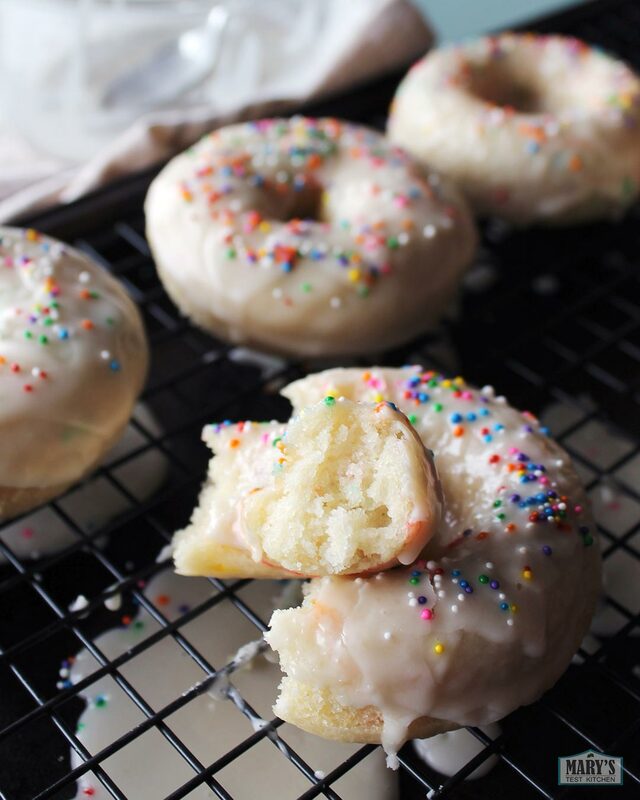 Turn ordinary pantry staples into these vegan confetti doughnuts in 30 minutes or less for an impromptu celebration or last minute birthday surprise! I was inspired by the awesome Funfetti cakes I’d been seeing on Pinterest lately but I was also in a doughnut kind of mood (when am I not though?). These doughnuts are much less work than a full sized cake: a few minutes to mix together, 15 minutes to bake, and a few more to cool then glaze. Dangerously easy. These bright, fun vegan confetti doughnuts have a soft and fluffy vanilla cake base with sprinkles throughout like funfetti cake, topped with simple white glaze and more sprinkles. True doughnuts are deep-fried. A true doughnut purist might call these glorified cupcakes shaped like doughnuts. I’d agree with them. But “glorified cupcakes shaped like doughnuts” isn’t very SEO-friendly…so don’t come for me! When you make the batter for vegan cake doughnuts, mix the dry ingredients very well before adding the wet ingredients. Then fold the wet and dry together just until they are combined. A few lumps here and there is to be expected as you really do not want to overmix. 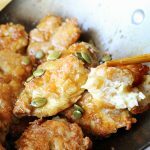 Overmixed batter tends to come out heavy and gummy after baking rather than light and fluffy. Also, add the sprinkles afterwards and fold them in with just a couple strokes. Sprinkles can bleed colour so over mixing can result in muddy colours. By the way, I have not tested this recipe with gluten-free all-purpose flour, only regular all purpose flour. I suspect this recipe will work with gluten-free flour, especially if it’s Bob’s Red Mill 1-to-1 Baking Flour. I’ve used it in muffins and pancakes with fantastic fluffy, great-tasting results so I expect it should perform the same way in this recipe. If you do try it, please let me know how it goes. 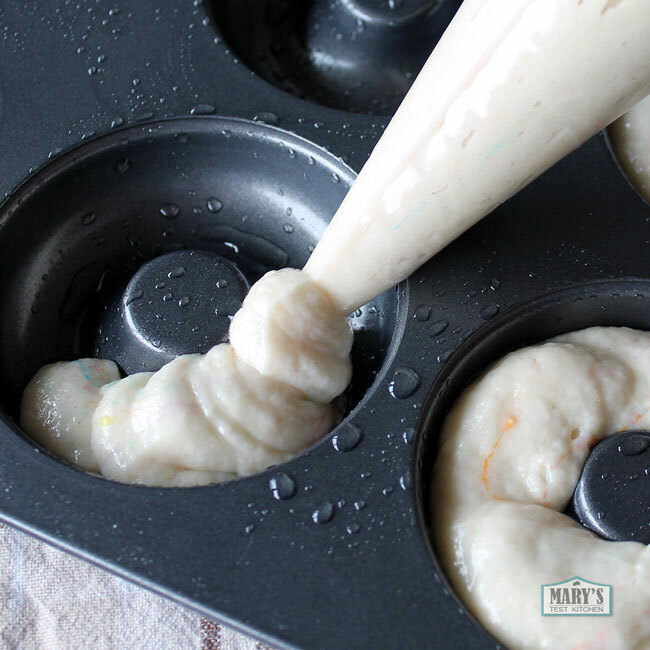 A piping bag makes filling the doughnut pan easier. You can carefully spoon the batter in a bit at a time as an alternative. Some sprinkles aren’t vegan-friendly because of insect-based ingredients like shellac (found in confectioner’s glaze) and carmine. However, vegan-friendly sprinkles are easy to order online. Some brands that aren’t labelled vegan may still be vegan-friendly. To be sure, write to the manufacturer directly. You’ll need a doughnut pan for this recipe. Or you can make cupcake shaped cupcakes instead of doughnuts. In that case, you’ll need to bake for longer. Make sure they’re cooked through by inserting a toothpick into the largest one. If it comes out clean, it’s done. Some sugar isn’t vegan-friendly. For more information on vegan sugar, see my note about sugar. After the doughnuts are baked and somewhat cool, you can use a simple glaze made from icing sugar, almond milk (or vegan milk of your choice) and vanilla extract. Glaze the tops of the doughnuts rather than the spongy bottoms. Otherwise, the doughnut will soak up the glaze before it sets. It will set soft in a few minutes so add the sprinkles before then. After about 30 minutes, the glaze will be hard set and it will be next to impossible to get sprinkles to stick. But you don’t have to wait that long to enjoy them! I hope you give this recipe a try and let me know how it went in the comments below. Enjoy! These bright, fun vegan confetti doughnuts have a soft and fluffy vanilla cake base with sprinkles throughout like funfetti cake, topped with simple white glaze and more sprinkles. For a brighter flavour, you can add lemon juice. In that case, add 1 tablespoon of lemon juice and use 1 tablespoon LESS of almond milk. 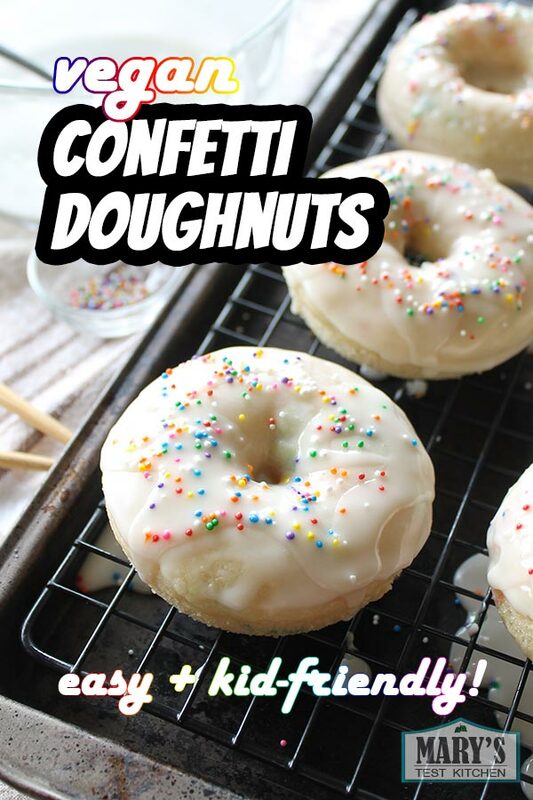 You will need a a 6 cavity doughnut pan for this recipe. Though not required, a piping bag would be useful for filling the pan. 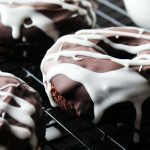 This recipe appeared in my video for Easy Vegan Cake Doughnuts. Preheat oven to 350°F. In a large mixing bowl, mix together the dry ingredients: flour, sugar, baking powder and salt. Also add nutmeg if using. Make a well and add the wet ingredients: almond milk, oil, and vanilla extract. Using a rubber spatula, give the wet ingredients a quick mix. Then, fold the wet and dry ingredients together until they are just incorporated. Some small lumps are expected; do not over mix. Add 1/2 teaspoon of the vegan sprinkles and fold in 2 - 3 times; do not over mix. Lightly grease your doughnut pan. Use a piping bag to fill each cavity. Alternatively, carefully spoon the batter in evenly. Bake for 15 minutes. While the doughnuts are baking, mix the white icing ingredients together until smooth. Set aside. When the doughnuts are done, let them cool for a few minutes in the pan. They should release easily with a light twist. See the video for a demonstration. Transfer them with top-sides up on a wire rack to cool further. When the doughnuts have cooled to room temperature (or pretty close; a bit warm is OK), stir the icing smooth, then spoon over the tops of the doughnuts, allowing some to drip over the sides. Add sprinkles within a couple minutes so they will stick. Feel free to layer the icing for a more opaque appearance. The glaze will set "hard" in about 30 minutes. Enjoy! *While I prefer almond milk, you can use any vegan milk alternative you like. If you want a brighter flavour, add 1 tablespoon of lemon juice to the wet ingredients but decrease the almond milk by the same amount. Semi-sweet chocolate chips are often vegan-friendly. Check the label to make sure they don't contain milk ingredients or buy vegan labelled chocolate chips. For soy-free diets, make sure to inspect the ingredients list for your vegan chocolate chips and vegan butter carefully as some contain soy ingredients. For details on vegan sugar, see my note about sugar. Hi, I recently tried making these, but as I was lacking a baking tin for donuts, I made cupcakes instead. They had a distinct taste of flour. The glaze however was perfect. What did I do wrong? Is it a result from possibly overmixing? Was it a raw flour taste? This means it was underbaked. When using cupcake tins, the bake time must be increased. The doughnut design allows for more heat over more surface area which is why the bake time is so short. I can’t tell you how long to bake in cupcake tins since I haven’t tested it with this particular recipe…but you can use the toothpick test. Overmixing is another possibility; what does the texture look like? Does it have a light bubbly kind of texture like in the video? Or is it quite dense? If it’s quite dense, it most likely is over mixing. These look delicious! Confetti doughnuts are just so fun. The recipe looks way too easy as well. 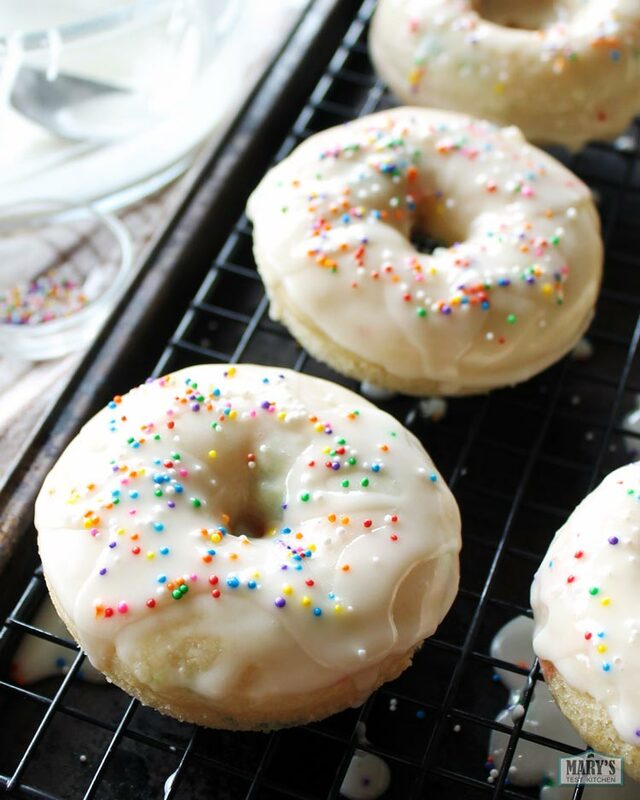 I want to try making a conventional glaze or even a maple glaze for these doughnuts!